Jade was feeling creative (or just not very hungry. 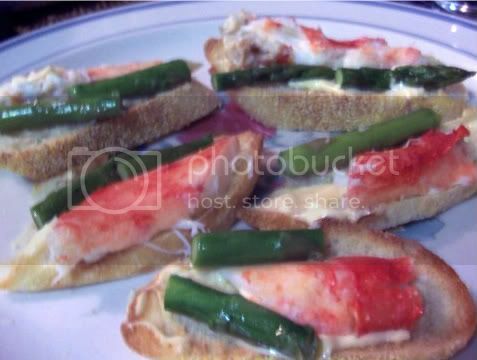 She was making these while the rest of us were tearing into crab shells) and made these beautiful crostinis by first toasting some french baguette. On top of that, she lathered on a mixture of mayonnaise and schiracha sauce (her own mixture) then topped it with a piece of king crab leg and a couple of spears of asparagus. The flavor combination was delicious!